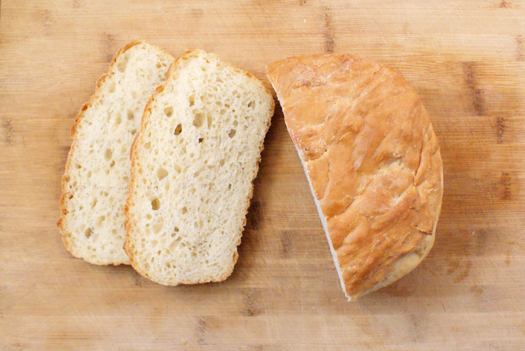 One of my New Year's resolutions this year was to make more homemade bread. I decided to put up a call out for recipe suggestions on my blog's Facebook page when I had some Minestrone in the works and no bread to serve with it. I was hoping one of my blogger friends would be able to suggest a stellar loaf or roll that would pair nicely with my soup. The Baking Fairy suggested I make Alexandra's Kithchen's recipe entitled "My Mother's Peasant Bread: The Easiest Bread You'll Ever Make". If that doesn't scream, "make me!" well then, I don't know what does. My husband and daughter are big bread fans and give me the evil eye if I serve dinner without it. This bread was perfect served as a dinner accompaniment, but also be good other meals like sandwiches for lunch and french toast for breakfast, which was good because it made two loaves. Well, we had no problem finishing off both loaves. We ate it with the Minestrone and continued to have it with every meal after that until it was gone. We had egg sandwiches the next morning, grilled ham and cheese sandwiches for lunch, and finished off the rest with spaghetti. Two loaves in 24 hours! It was crispy on the outside and soft and airy on the inside. I'll be making it again, for sure. In a large mixing bowl, combine the flour and the salt. In a small bowl, dissolve the sugar into the water. Once all of the sugar is dissolved, sprinkle the yeast over top. Set it aside and let it sit for 10-15 minutes, then gently stir it up and add it to the flour mixture. Stir with a rubber spatula or wooden spoon until full combined. Cover the bowl with a small towel (dampened with hot water and wrung out) or with plastic wrap. Grease two 1 liter oven proof bowls (I used square pyrex high sided one liter casserole dishes) with one tbsp of butter each. Using two forks, punch down the dough, scraping it from the sides of the bowl. As you scrape it down, turn the dough up onto itself. Take your two forks and divide the dough into two equal portions and place into your prepared bowls. Let the dough rise in the bowls on the counter for another 30 minutes. Bake for 10 minutes, then reduce the oven temperature to 375° and bake for an additional 22-25 minutes. Remove from the oven and turn them upside down to take them out of the bowl. Cool on a cooling rack for 10 minutes before cutting.